Yes I'm going to Poland ??? 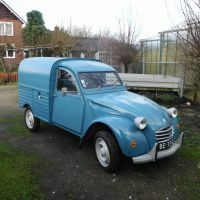 which sits between the carburettor and the airfilter... the advantige of this system is that it is very simple to get your 2cv going on lpg but the disadvantige is that the air is restricted by the mixer so your topspeed goes down by 10 km/h..
need to heat the reducer... I do this with water and a pump. I've wrapped some copper pipe around the exhaust which heats the water. I'm intrested also doesn't the water never go to a boil phase because of constant heating in the exhaust ? Giving full throttle, the exhaust will heat up, but also a lot of gas is used thus evaporated so a lot of cold is generated. When cruising along the exhaust is only marginal hot, but you are using less gas, so you need less gas to evaporate so less cold is produced in the reducer.. So no I have never had a boiling water experience... You have to experiment a little with the lengtht of the copper pipe around the exhaust and once it is working well it will work fine.. In my Ami I only filled it up once with coolant (because it can freeze) and I'm drivingitfor over 2 years now... About 2 weeks ago I checked the waterlevel first time again and it is still the same as 2 years ago... meaning it works well..
Can I borrow that spotwelder ? I'm still figuring out how to adjust the applied pressure, if anybody how this is set???? this is for welding wheelarches (at normal cars).. This afternoon I tried to weld some examples to get a feeling of the welder and welding.. Here some examples of the welding..